Hello~~ Hello~~ I am so glad to be back and my break over. I have missed being here very much. I look forward to visiting you soon along with sharing what I have been up to this past month. It seems I have started a pattern of redos and redesigns each year after Christmas. 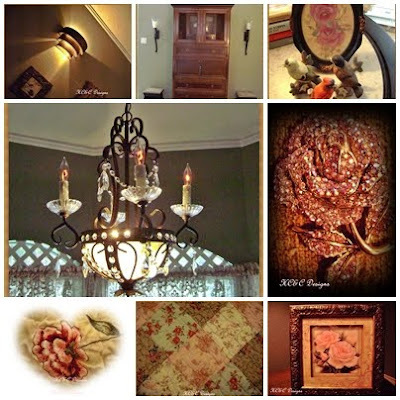 Once the holiday decor is put away, I get the design bug to freshen and decorate with a new look. This year is no different. I was going to rest my painting arm. Was going to catch up on all the unfinished projects waiting for completion. Was going to just be still for awhile! Not going to happen with me. 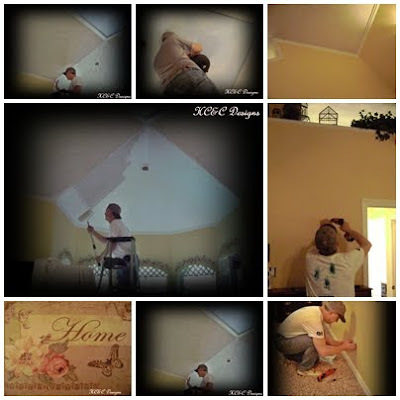 My Best Guy and I had plans to paint and redesign the master bedroom and bath. So with design board ready to go and inspiration upon us, we began. While BG worked on the high places, I did the cut in work on the walls below. It is a large room and the ceiling took a lot of time and paint. I used a soft creme for the ceiling color but kept the sky in the center that I added a few years ago. 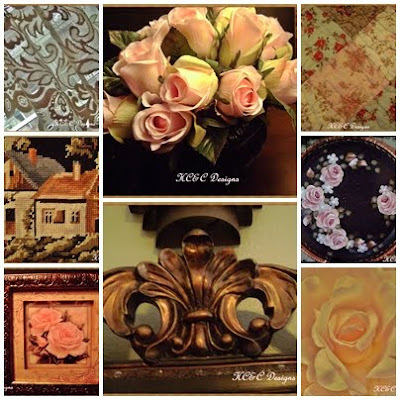 The walls are a Tuscan Italian Sage and is the color I use for my leaves when I paint roses. It is soft, calm and goes gorgeous with what else, but PINK! Yes I incorporated very pale pink with this redo. So much of the accents are iron in an oil rubbed bronze and the pink is very pretty with it. Vintage copper and pink is lovely together with the black furniture along with the cottage accents of linen lace for the windows. The quilt has a square of the palest pink that is very soft, but yet there. Bringing in pink roses really works in a vintage old world way. Here are a few more accents from around the room. The gorgeous iron and crystal chandelier is very cozy over the sitting area, and another just like it, hangs over the jacuzzi tub. I used crystal accents throughout along with the vintage copper. One discovery with paints I found, was to use black diamond metallic mixed on the palette with vintage bronze. The result is perfect to reflect the oil rubbed bronze. I used this technique on drawer pulls and took them from the dated brass to the new look of Tuscan style. Now the master bath was also painted and I will share those pics along the way as the workman start to replace the shower walls and floor. All this begins next week. Here are a few more pics from around the new room. This embroidery rose is all along the quilt frame. I love the handmade vintage style. On the bed is a pillow that was an inspiration from the beginning. Handmade by the talented Tammy of A Stitch in Thyme. I love it! Now it is back to work and creating. I have lots in the studio to complete and bring to my etsy shoppe along with finishing a few customs from way before the holidays. But in the meantime, I want to add how the start of the new year has been a blessing to so many, even though, there has also been so much heartache in the world through disaster. As we keep our hands busy and our hearts full. Let's remember those that are struggling whatever it be. Our prayers, thoughts and help remain with the people of Haiti. And here at home, let's remember those that are sick, loss of jobs, and those that have passed on to a better place with our Lord. Thoughts mean a lot, but thoughts are nothing without prayers. So happy to be back and excited to be creating full steam!! Blessings and Blue Skies to you all. Welcome back and the room looks so lovely. I can see all the hard work that you have put into it. Just beautiful. It's great to see you back! I love the room...everything looks so comfy and just beautiful. The colors you used and just fabulous. It is a room to dream in....!! Welcome back ~ Celestina Marie and it was so neat to see all the decorating you have been doing. Look forward to seeing all your creations and visiting you this year. Welcome back Celeste! Your room is beautiful! Of course, I would not have expected anything else. Your creativity is superb! Cannot wait to see more. It is fabulous...so pretty..those curtains are gorgeous as well as your chandelier! Welcome back. Your bedroom is gorgeous. I can't wait to see how you decorate your bathroom. I love your chandelier. The master bedroom is a grand success. You have done an astounding job. Love it. Good to have you back. I was going to say I hope you had a restful break but after reading your post I know you have been very busy. Your room redo looks wonderful. I love quilts. Yours is so soft and pretty. I think your chandelier is stunning and I'm sure the one in the bathroom is as well. Aren't hubbies wonderful they way they pitch in there and help! Look forward to seeing more pics. adore it all....your mosaics are beautiful!!!! Welcome back, sweet lady! I missed popping over to see what you are doing ... but obviously you did a LOT of exquisite recreating of that boudoir ... so warm & elegant. Go back to a post within the past week that I did & take a peek at my dining room, love to know what you think of it. Your design concept and the creation of your bedroom is beyond beautiful. delighted to have your company once more! :) thank you for your visit. Yay! You're back! I love your bedroom! Everything looks so pretty! You and your husband have done a beautiful job! Love it all! I know you're thrilled with it. 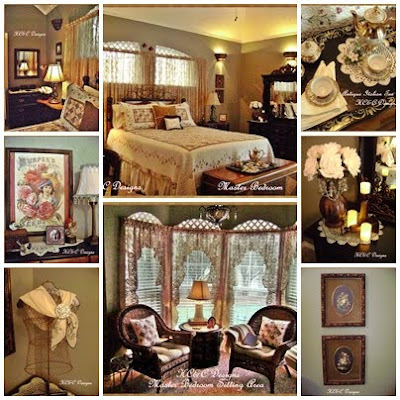 Celeste, welcome back from your great...your master bedroom looks like a gorgeous B&B. Congrats to you both on your beautiful work. Can't wait to see the bathroom! Gorgeous Celeste style as always. Glad you're back! Welcome back, looks like you have been a busy bee! The room looks wonderful (as always)! Love the chandeliers and the quilt, it's all so very pretty! Are you watching the Big Game today? We are throwing a big party for 27 ... this should put the new great room to the test! Welcome back! :-) When you said you are going to be busy, well you sure have! :-) The bedroom is so gorgeous and very elegant. Celeste, just catching up to you! All of your decor pics are fit for a magazine! As are the photos you have altered - so ethereal and pretty! Must get on with my day and wish I could linger here a bit longer. But wanted to stop by with a hug for you! Such a pretty room. I especially like the guilt and chandelier. What a cozy place. Happy Valentine's Day.